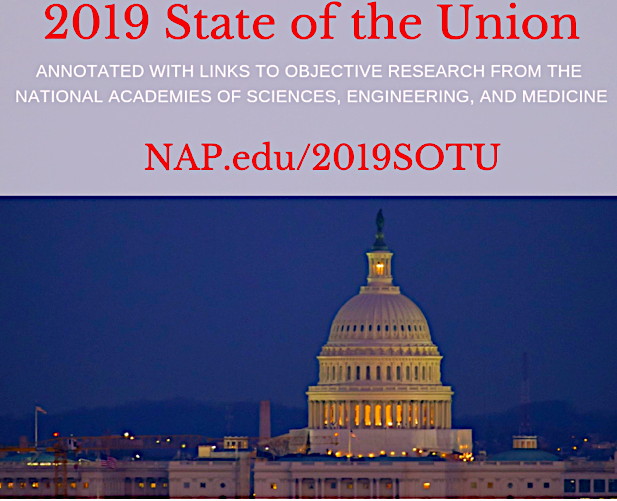 After a century and a half of bipartisan slumber, The National Academy of Science awoke in 2009 to the necessity of annotating the State Of The Union address. It has added to this year's 5,000 presidential words 17 links to NAS reports. We meet tonight at a moment of unlimited potential. America is a Nation that believes in redemption. We are also joined tonight by Matthew Charles from Tennessee. In 1996, at age 30, Matthew was sentenced to 35 years for selling drugs and related offenses. Over the next two decades, he completed more than 30 Bible studies, became a law clerk, and mentored fellow inmates… welcome home. I pledge to you tonight that we will never abolish our heroes from ICE…drug detection at our ports, closing loopholes that enable child smuggling, and plans for a new physical barrier, or wall…I’ll get it built. I know that the Congress is eager to pass an infrastructure bill — and I am eager to work with you on legislation to deliver new and important infrastructure investment, including investments in the cutting edge industries of the future. This is not an option. No force in history has done more to advance the human condition than American freedom. In recent years we have made remarkable progress in the fight against HIV and AIDS. Scientific breakthroughs have brought a once-distant dream within reach… Together, we will defeat AIDS in America. To defend the dignity of every person, I am asking the Congress to pass legislation to prohibit the late-term abortion of children…made in the holy image of God. The final part of my agenda is to protect America’s National Security… As part of our military build-up, the United States is developing a state-of-the-art Missile Defense System.